As it turns out, Ford was indeed preparing a new entry-level performance Mustang, but instead of the rumoured SVO, what we have here is a 2.3L High Performance Package for the base Mustang EcoBoost coupe and convertible. When it goes on sale this fall as a 2020 model, it will become the most powerful four-cylinder sports car offered by an American automaker. Also: 2020 Ford Mustang Shelby GT500: 700 HP… and a Speed Limit? 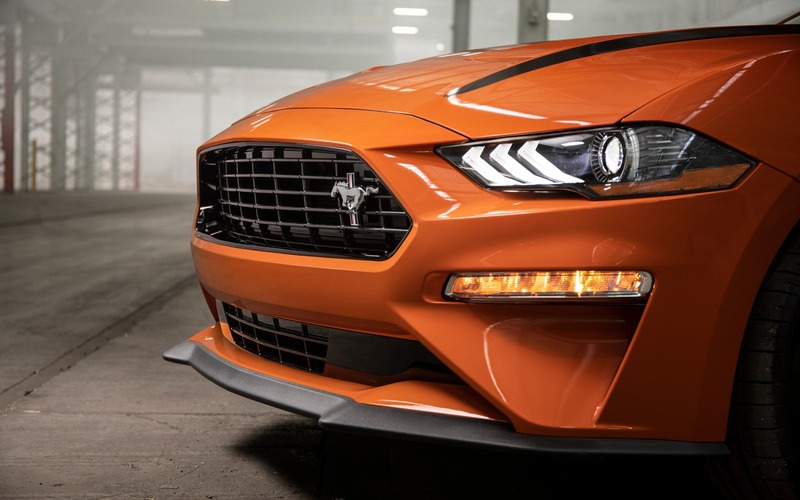 Inspired by the now-departed Focus RS, the Mustang team worked with Ford Performance to develop a new variant of the turbocharged four-cylinder engine specifically for the pony car. Using a die-cast alloy block, a high-performance cylinder head and a slightly larger turbo compressor, among other upgrades, the 2.3-litre unit was pushed to 330 horsepower and 350 lb.-ft. of torque (achieved with premium fuel), putting it squarely on par with the Chevrolet Camaro’s 335-horsepower V6. It was also calibrated to run with both the six-speed Getrag manual transmission and Ford’s 10-speed SelectShift automatic. As a result, the 2020 Ford Mustang EcoBoost with the 2.3L High Performance Package gets to 100 km/h in the mid-four-second range. Top speed is increased to 250 km/h. This is only half the story, however. Look for a more exhilarating drive thanks to the 2.3L High Performance Package’s fully active quad-tip exhaust system offering a tuned, model-specific exhaust note. 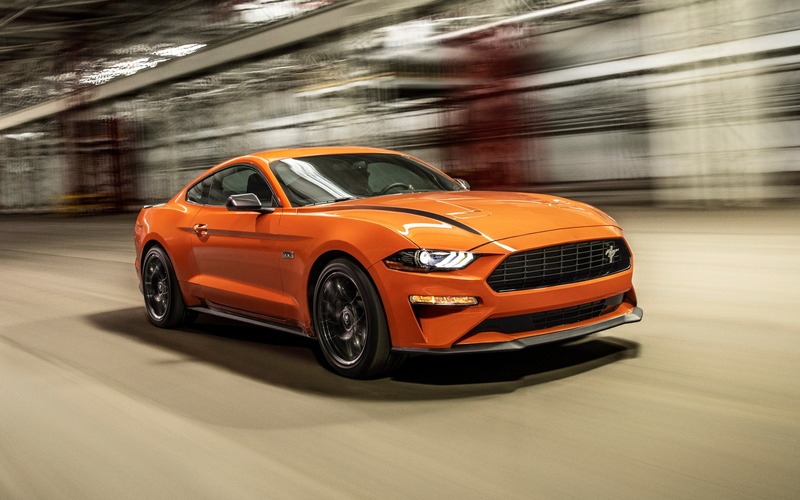 The car boasts a near-perfect 53/47 weight distribution as well as chassis and aerodynamic upgrades from the Mustang GT and its Performance Package. For example, an alloy strut tower brace was added to stiffen the chassis at the front and improve handling, while larger four-piston callipers with 13.9-inch front rotors from the Mustang GT increase stopping power. New performance calibration tuning was applied to the electronic power steering, antilock braking, stability control and five driver-selectable drive modes. The package also includes specific 19x9-inch machined-face aluminum wheels and 255/40R summer tires. 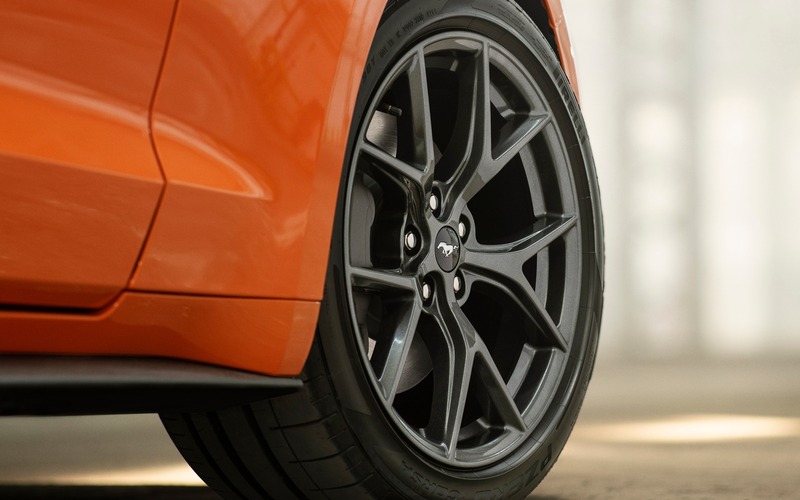 Customers can take it up another notch with a new EcoBoost Handling Package featuring semi-metallic brakes, specially calibrated MagneRide dampers, a TORSEN 3.55:1 limited-slip rear axle, a larger rear sway bar and wider wheels shod in Pirelli P Zero Corsa4 summer tires. Aesthetically, the 2020 Ford Mustang EcoBoost 2.3L High Performance Package stands out with a large black front splitter and belly pan, brake cooling ramps from the Mustang GT Performance Package, a blacked-out grille with offset Mustang tri-bar pony emblem and a raised blade rear spoiler, not to mention unique metallic grey stripes across the hood and special badging throughout. Inside, you’ll find an engine-spun aluminum instrument panel with oil pressure and turbo boost gauges, plus a serialized dash plaque. In related news, the new 2020 Ford Mustang will now come standard with FordPass Connect, allowing owners to locate their parked car, lock/unlock the doors and check vital information such as fuel level and maintenance alerts via a smartphone.